I was loving life with my Clydesdale mare Mary and catching up with like minded women to participate in horse riding for beach rides and camps over the weekends. This was filling my need for time out and fitness however life changed after a fall caused chronic pain and discomfort. While I was fully independent one day, the next meant bed rest, no driving and the dreaded wheelie walker! I was left feeling frustrated and my Doctor informed me "NO MORE RIDING!" Sadly I sold my beautiful mare to a gorgeous friend and considered my 'what next ' options. I decided that I was not going to fall into depression and despair and drew on my love for gardening, growing roses and fairy gardening. I made the brave leap and enrolled in a floristry course and began my new adventure. My student practical days are Mondays and are shared with an inspiring group of ladies. We encourage one another with ideas and support and a lot of laughter! I was offering my student work at discounted prices at the end of the day when I quickly received interest from friends and family who began paying me to complete their floristry needs. With this in mind I chose to share my love of flowers, and started my own floristry business "The Rose Cottage Florist Townsville" as a sole trader. I am excited to create beautiful bouquets and floral arrangements for the local Townsville community as a home based florist. Conveniently, our family is also building our dream home at Bushland Beach (due for completion late 2018) with a purpose built floristry space in the garage for workshops and my online business. I am excited to announce that I will be planning a cutting garden with gladiolus, sunflowers and highly scented roses that will be added to my bouquets when seasonally available. My new website www.therosecottageflorist.com is live however is a work in progress. I will gradually add new selections to my webstore as I grow. In the meantime please call me on my mobile or email me for ordering and more information. Please provide me with two weeks notice for large corporate orders. 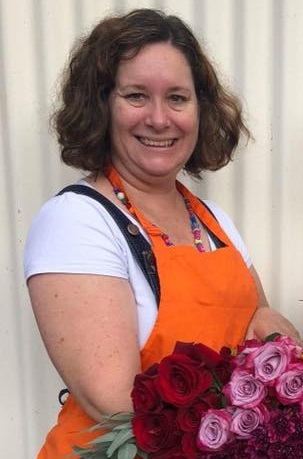 Danielle Malpas is owner/operator of The Rose Cottage Florist in Townsville.